Nouriel Roubini earned the nickname 'Dr Doom' for his gloomy predictions on the global economic crisis. (CNN) -- Rapidly rising oil, energy and food prices pose a serious threat to global stability, leading U.S. economist Nouriel Roubini has warned. Speaking at the World Economic Forum's 2011 annual meeting in Davos, Switzerland, Roubini said the global economy was a "glass half-full and a glass half-empty", with some signs of recovery. But he told CNNMoney.com there were still "many things that could go wrong" in the coming year. Asked to pick what he considered the biggest new threat, Roubini -- who earned himself the nickname "Dr Doom" for his pessimistic predictions during the economic crisis -- highlighted the large increase in commodity prices. He said the rapid rise "could be a source of political instability, not only economic and financial fragility." Where on earth is the economic growth? Schwab: What does the new reality mean? "What has happened in Tunisia and is happening right now in Egypt, but also the riots in Morocco, Algeria, Pakistan are related not only to high unemployment rates and to income and wealth inequality, but also to the very sharp rise in food and commodity prices." Roubini, an economics professor at New York University's Stern School of Business, said the world had seen only too recently the effects a spike in commodity prices could have. "When oil reached $148 a barrel in the summer of 2008, that was the tipping point for the global economy, it led to the global recession - it was not just the effect of Lehmann [Brothers]," he said. "That rise in oil and commodity prices led to a significant negative effect on income and spending in the US, in Europe, in Japan, in China and in India -- in all the net commodity importers." 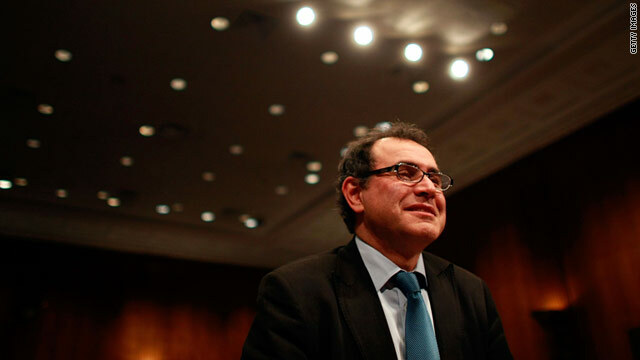 Roubini told CNN the U.S. the eurozone and China would all face tough challenges over the coming year. In the U.S. he said growth of around 3% was likely, but that unemployment would remain high. In addition, "the housing economy is already double-dipping and prices are falling, we have the state and local government problem and the federal deficit problem." Earlier in the day, Roubini told a panel at the WEF that countries on the periphery of the eurozone were still at risk, because of a continuing lack of economic growth, which he warned could lead to further social unrest. "If you're not going to have economic growth, the social and political backlash against austerity and reform is going to become worse, because people don't see light at the end of the tunnel." He said China had spent too long putting off dealing with its economic issues, and could face a reckoning this year -- with implications for the rest of the world. "China's been behind the curve in terms of monetary tightening - they've done it too little compared to what they should, and the risk is now inflation might get out of control. "Because they don't want to lose competitiveness and trade and exports... they're pushing the problem down the road, and then when inflation really rises they'll have to tighten much more," he said. "Every time China tightens, the effect on equity markets, not just in China and Asia, but globally, is significant." The great Davos talking shop is now up and running. So how do you become a Davos delegate? While the developed nations drag their feet on inclusive trade agreements with emerging markets, Africa is busy redefining itself. Organizers say the theme of this year's Davos forum "Shared Norms for the New Reality," reflect how the world has changed in the last year. The past few Davos meets have been dominated by the economic downturn -- time now to face the new reality. Want to know where to begin with Davos? CNN's Richard Quest offers a primer on this year's events. With men and women in the west happily living into their 80s and 90s, the impact on health care, pension systems and the jobs market is profound. Davos is a hot-house in the cold of winter where, every now and then, something gets done, says Richard Quest. World Economic Forum founder Klaus Schwab is concerned that world leaders have too much on their plate.